Service provided on YOUR struts only. Can be raised from 16 to 30 mm, depending on usage and wheel size. 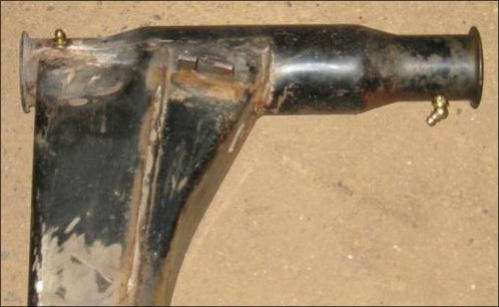 Steering arm is recurved to eliminate bump steer. Suitable for all 914 and 911 Boge struts. Stock unit on left shown for comparison. Measure available clearances with your wheels before ordering! 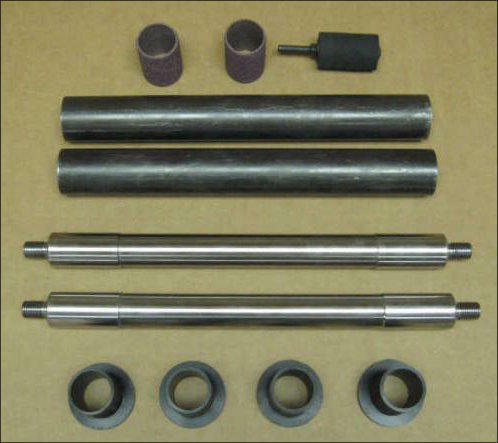 We’ll replace the stock rubber bushings in your trailing arms with high performance Delrin, using our Trailing Arm Bushing Kit. Includes grease fittings installed. 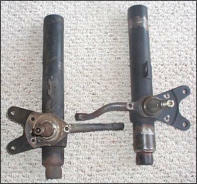 New pivot shafts may be required if yours are rusted. 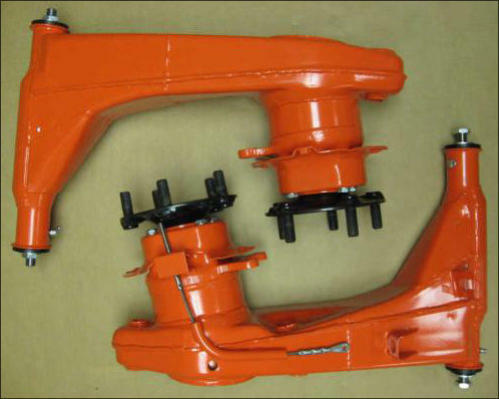 Send Us Your Trailing Arms for the Ultimate Rear Suspension Upgrade! 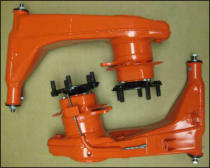 Welded Internal and External Reinforcements eliminate flex and twist. Jigged during assembly for precise camber and toe alignment. High performance Delrin Bushings. Grease fittings installed. New Heavy Duty Solid (heat treated CrMo) Pivot Shafts. Powdercoated in your choice of Black or Orange. New Wheel Bearings Installed; New Aluminum Bearing Covers. 911 e-Brake Backing Plates and Adapter Cables Installed. Your hubs Reinstalled. Choice of: Stock Camber angle - best for racing on DOT tires, Reduced Camber for Lowered Street Cars, Zero Camber Angle for Racing on Slicks.